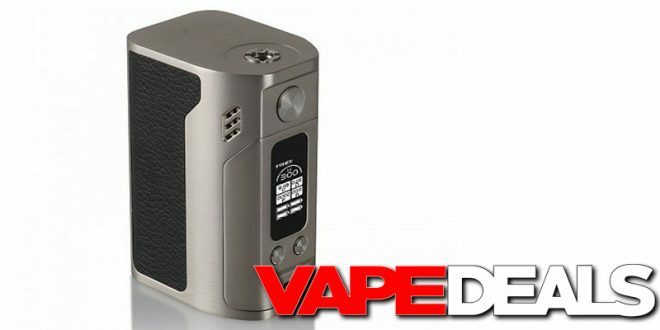 If you didn’t take advantage of the Wismec Reuleaux RX 300 deal we featured the other day, this one might be worth checking out. Vapesourcing currently has it on clearance for $28.90. That’s already a great price…but you can still use coupon code “Halloween” to save 12% sitewide. Grand Total: only $23.76. And just to sweeten the deal, you can get it shipped from their US Warehouse for FREE! Just keep in mind that the Halloween code expires TODAY (11/7), so you’ll need to move fast. **Please note that this price applies to the silver colorway only (+$1.76 for black). The carbon fiber versions are on sale for a few dollars more, but they’re not offering free shipping with that one.